For rough curled hair or hard to straighten curled hair, choose 230? (450?) setting. For normal hair, choose 180? (355?)-190? (375?) setting. 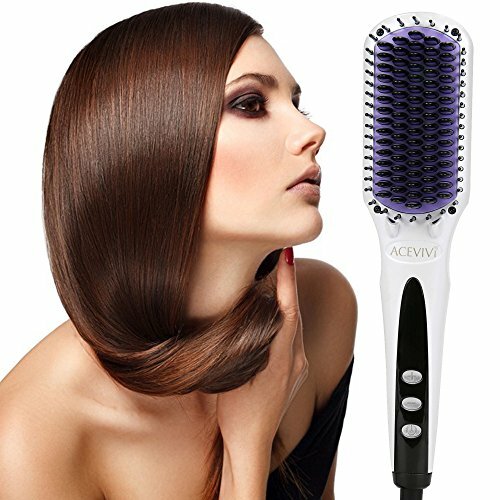 Why Choose ACEVIVI hair brush straightener? 1. The shell adopts enhanced PET, strong capacity of heating insulation, high intensity. 2. Unique anti-scald design on the top and around the comb teeth, so it won't hurt your scalp. Remember DO NOT touch the purple area--it's hot. 3. Double Anion launching release more anion to 79 nano comb tooth and 158 heating panel, tighten the hair cuticle, eliminate Static electricity. 4. Korean tourmaline ceramic coating repairs shriveled hair and makes hair shiny doubly. 5. Power off and pull out the plug after using it. Auto shut-off protection if NOT IN USE for 60 minutes. 6. The product effect works best when hair washed. In order to get professional hairdressing effect, you have to prepare for straight hair, drying hair after washing, then use the intelligence electric hair straightener comb, appropriate comb, then hair get straight and effect long lasting. Heating up fast, 90 seconds can up to 230 degree, faster take care of hair. With double anion spray, it can maximize the styling effect of smooth, shining and elegant after using. Adjustable Digital Temperature control, LCD display from 150-230 degree Comb tooth top and around adopts anti static ceramic design, which ensure the comb tooth surface smooth and constant temperature. The product effect works best when hair washed. In order to get professional hairdressing effect, you'd better wash and blow dry hair, then use the ACEVIVI intelligence electric hair straightener comb, your hair will get straight and effect long lasting.